Are our courses easier than sleeping? lecture than when they’re asleep. Updated for the humorless. See postscript below. Long-term assessment of EDA [a measure of nervous system activity] revealed interesting trends in the participant’s sympathetic modulation over a week-long period. Intervals of elevated EDA frequently corresponded to times when the participant was studying, doing homework, or taking an exam. This is possibly due to the increased cognitive stress associated with these activities. 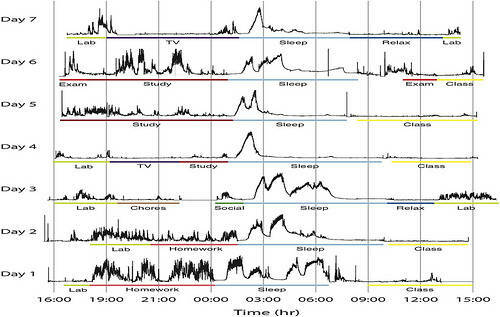 The characteristic peaks occurring during sleep have been associated with slow-wave sleep  and remain a subject for future studies. So what does this mean for our classes? Well, it means that we now have Science (granted, n = 1) to back up our intuition that lecturing is a terribly inefficient way of conveying information. What is to be done? It’s time to scrap the lecture. I’ve been a convert to anti-lecturing for a while, but Eric Mazur helped me put intellectual muscle on a skeleton that I’d gotten from reading Ken Bain’s What the Best College Teachers Do. The basic idea is straightforward: Any communication that requires passive acceptance of the material by the student is bad. The idea is to generate active engagement on the student’s part with the material–whether by asking questions, generating discussion, or, from time to time, coercing (gently!) participation. Easy in seminar. Hard in lecture. But technology–especially in-class clickers (as publicized here by Professor Matt Carnes of Georgetown and probably by a colleague or a mentor in your department; see also the first pages of Brad DeLong’s intro lecture) allows for scalable participation much more easily. Lectures are more a ritual and a convenience than a pedagogical tool. But in the absence of tutorials and seminars for all, we should at least make them more challenging than napping. Postscript: I should have learned by now that there is no joke so obvious that some pedant won’t get it. The paper I linked to, the post I linked to, and this post that I wrote all made it clear to varying degrees that we understand that (a) this is not a perfect or even a good measure of cognitive effort and (b) that this is a very small (“n=1″!) sample. So, thanks to the Twitterers who pointed out that this is not Science!!!!1!. Mazur’s lecture (cheap irony alert) is both long and well worth the time. I suggest that the truly interested take the time to watch it. This post, after all, was nothing more than an excuse to link to it.